Butternut squash curry and other preparations are fairly common in different parts of India but call it a “squash” in that part of the world and you could be met with a blank stare. Some may call it squash, we say it’s a pumpkin. You know, tomayto-tomahto. Butternut squash is called Kalyaana Poosunikai in Tamil (spoken in the southern region of the Indian sub-continent and among the oldest “living” classical languages…. whoah! Yup.) which can roughly be translated to Wedding Pumpkin. I’ve always assumed it was favored in wedding menus at the time of its christening but I’m just guessing wildly. 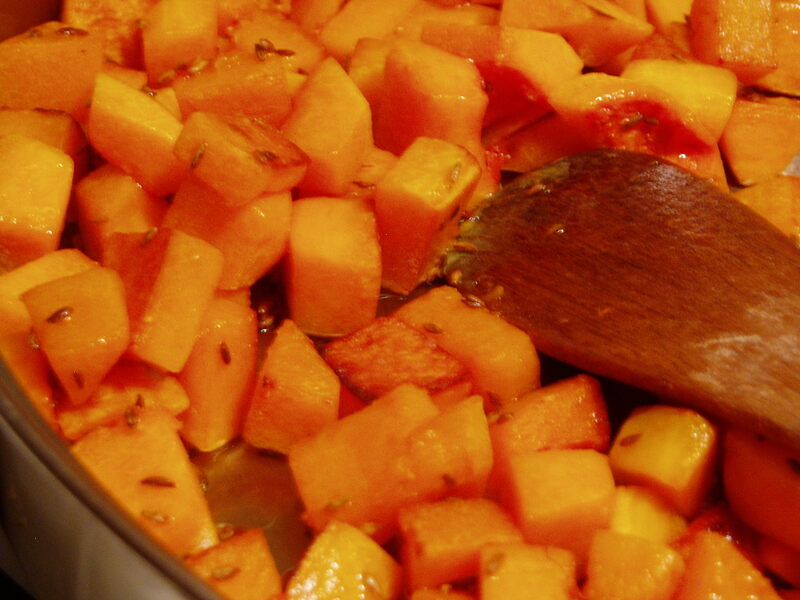 This butternut squash curry recipe was another delectable find from Gourmet magazine. It goes further South and further East than India but it’s simple and the ingredients are kitchen staples which makes it my favorite kind of recipe. See the original recipe here. I added garlic, butter and adjusted other portions for my taste and the order in which I cook some of the ingredients may vary. Heat half the oil and butter in a skillet over medium heat, add cumin and let it splutter, add squash and saute until it browns 5 – 8 minutes. Set squash aside. Return the skillet to the heat with remaining oil and butter. Add the cinnamon and cloves followed by the onion, cook stirring occasionally until the onion is translucent. Add half the coconut milk and wait for it to simmer 2 -3 minutes. Add curry paste and fish sauce, simmer for another 2 – 3 minutes. Add the remaining coconut milk along with 1/2 a cup of water and cook for about 5 – 8 minutes. Add spinach slowly and stir it in as it wilts. Add salt and adjust to taste. Serve a generous portion on jasmine rice, sprinkle the cashew nut on top. Some batter fried shrimp rounds this out into a nice an easy winter night meal. 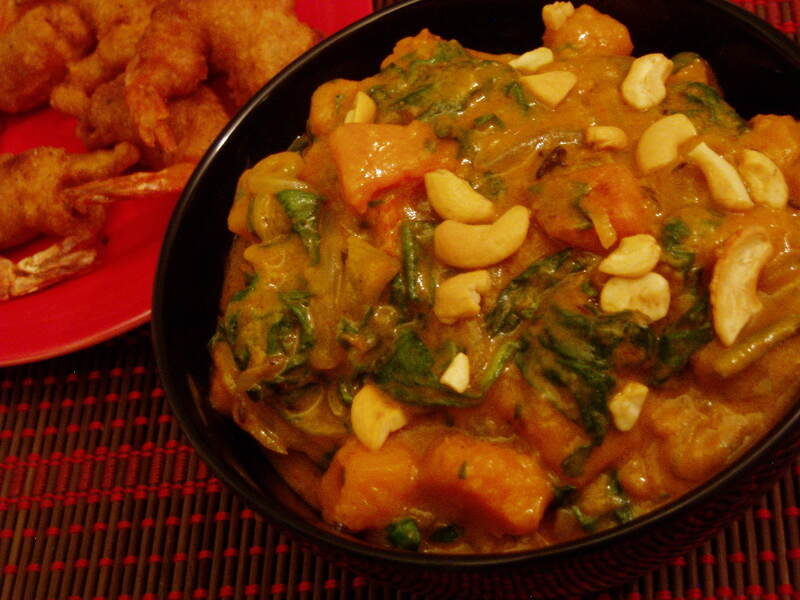 I definitely have the winter blues… however, butternut curry might be the thing to snap me out of it. I have never thought of the combination of curry and butternut. It would definitely work though! I am going to try it.